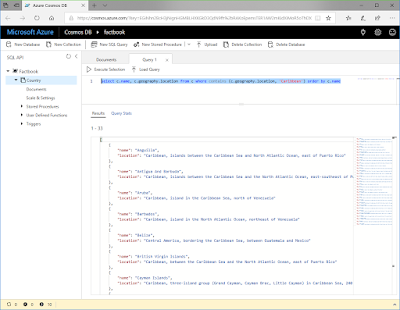 In this 3-part post, I'm going to show how you can take CIA World Factbook data and use it for your own purposes on Microsoft Azure. Here in Part 1, we'll create the back end by retrieving the data and storing it in a Cosmos DB using Azure Durable Functions. In Part 2, we'll create the front end including an API and a web site for browsing, querying, and reporting on the data. In Part 3, we'll take the front-end further with analytics and charting. Let's take a look at the end result. When we're done with Part 1, we will bring an extensive amount of data on countries of the world into a Cosmos DB database, which we'llbe able to query in numerous ways. 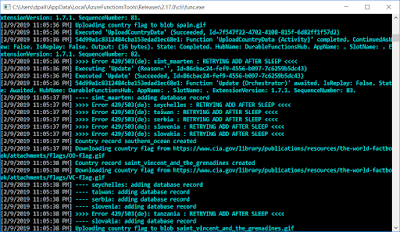 We'll also be putting the JSON record for each country in blob storage, along with its flag and map image. 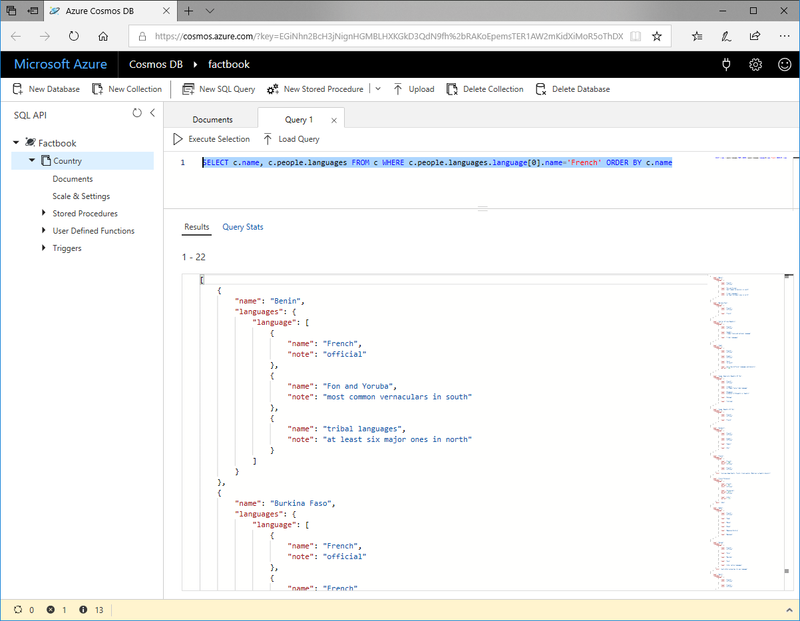 We'll handle both the initial data capture, and subsequent updates, using Azure Durable Functions written in C#/NET Core. Because the single large JSON download contains data for 260 countries, we'll be using a fan-out / fan-in pattern to store the data, Map/Reduce style. The US Central Intelligence Agency publishes an alamanc-style reference on the countries of the world known as the CIA World Factbook. There's a wealth of data, and you can learn a lot on the site. I urge you to explore it and drill into the detail. What if you want to use this data in a different way? Perhaps you want to expose the data in a different user interface; or combine it with other data in your possession; or analyze it; or create infographics. Conveniently, the factbook data is in the public domain: "The Factbook is in the public domain. Accordingly, it may be copied freely without permission of the Central Intelligence Agency (CIA). The official seal of the CIA, however, may NOT be copied without permission as required by the CIA Act of 1949 (50 U.S.C. section 403m). Misuse of the official seal of the CIA could result in civil and criminal penalties." "background": "Armenia prides itself on being the first nation to formally adopt Christianity (early 4th century). Despite periods of autonomy, over the centuries Armenia came under the sway of various empires including the Roman, Byzantine, Arab, Persian, and Ottoman. During World War I in the western portion of Armenia, the Ottoman Empire instituted a policy of forced resettlement coupled with other harsh practices that resulted in at least 1 million Armenian deaths. The eastern area of Armenia was ceded by the Ottomans to Russia in 1828; this portion declared its independence in 1918, but was conquered by the Soviet Red Army in 1920.\nArmenian leaders remain preoccupied by the long conflict with Azerbaijan over Nagorno-Karabakh, a primarily Armenian-populated region, assigned to Soviet Azerbaijan in the 1920s by Moscow. Armenia and Azerbaijan began fighting over the area in 1988; the struggle escalated after both countries attained independence from the Soviet Union in 1991. By May 1994, when a trilateral cease-fire between Armenia, Azerbaijan, and Nagorno-Karabakh took hold, ethnic Armenian forces held not only Nagorno-Karabakh but also seven surrounding regions - approximately 14 percent of Azerbaijan’s territory. The economies of both sides have been hurt by their inability to make substantial progress toward a peaceful resolution.\nTurkey closed the common border with Armenia in 1993 in support of Azerbaijan in its conflict with Armenia over control of Nagorno-Karabakh and surrounding areas, further hampering Armenian economic growth. In 2009, Armenia and Turkey signed Protocols normalizing relations between the two countries, but neither country ratified the Protocols, and Armenia officially withdrew from the Protocols in March 2018. In January 2015, Armenia joined Russia, Belarus, and Kazakhstan as a member of the Eurasian Economic Union. In November 2017, Armenia signed a Comprehensive and Enhanced Partnership Agreement (CEPA) with the EU. In spring 2018, Serzh SARGSIAN of the Republican Party of Armenia (RPA) stepped down and Civil Contract party leader Nikol PASHINYAN became prime minister." "comparative": "slightly smaller than Maryland"
"restart of Metsamor nuclear power plant in spite of its location in a seismically active zone"
"note": "spoken by Yezidi minority"
"etymology": "the etymology of the country's name remains obscure; according to tradition, the country is named after Hayk, the legendary patriarch of the Armenians and the great-great-grandson of Noah; Hayk's descendant, Aram, purportedly is the source of the name Armenia"
"note": "9 hours ahead of Washington, DC, during Standard Time"
"etymology": "name likely derives from the ancient Urartian fortress of Erebuni established on the current site of Yerevan in 782 B.C. and whose impresive ruins still survive"
"note": "from the Soviet Union"
"note": "a 2015 amendment, approved in December 2015 by a public referendum and effective for the 2017-18 electoral cycle, changes the government type from the current semi-presidential system to a parliamentary system"
"non-party state to the ICCt"
"note": "Nikol PASHINYAN resigned his post (but stayed on as acting prime minister) on 16 October 2018 to force a snap election (held on 9 December 2018) in which his bloc won more than 70% of the vote; PASHINYAN was reappointed prime minister on 14 January 2019"
"election_results": "percent of vote by party - My Step Alliance 70.4%, BHK 8.3%, Bright Armenia 6.4%, RPA 4.7%, ARF 3.9%, other 6.3%; seats by party - My Step Alliance 88, BHK 26, Bright Armenia 18; composition - men 112, women 20, percent of women 15.2%"
"subordinate_courts": "criminal and civil appellate courts; administrative appellate court; first instance courts; specialized administrative and bankruptcy courts"
"note": "bloc of independent and opposition parties"
"note": "Civil Contract Party and Mission Party"
"description": "three equal horizontal bands of red (top), blue, and orange; the color red recalls the blood shed for liberty, blue the Armenian skies as well as hope, and orange the land and the courage of the workers who farm it"
"note": "data are in 2017 dollars"
"note": "this is the Refinancing Rate, the key monetary policy instrument of the Armenian National Bank"
"note": "average lending rate on loans up to one year"
"note": "drams (AMD) per US dollar"
"international": "country code - 374; Yerevan is connected to the Trans-Asia-Europe fiber-optic cable through Iran; additional international service is available by microwave radio relay and landline connections to the other countries of the Commonwealth of Independent States, through the Moscow international switch, and by satellite to the rest of the world; satellite earth stations - 3 (2015)"
"ethnic Armenian groups in the Javakheti region of Georgia seek greater autonomy from the Georgian Government"
"country_of_origin": "Syria - ethnic Armenians"
"note": "illicit cultivation of small amount of cannabis for domestic consumption; minor transit point for illicit drugs - mostly opium and hashish - moving from Southwest Asia to Russia and to a lesser extent the rest of Europe"
As you can see, the data is extensive. How should we store this data in Microsoft Azure? 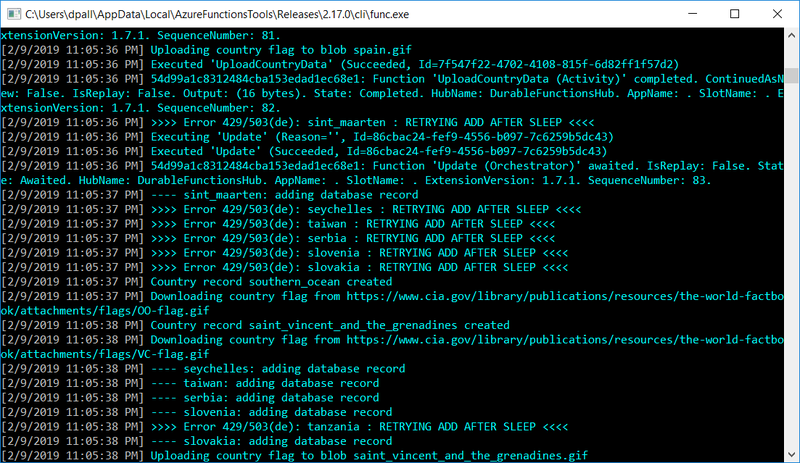 One answer is to extract the JSON for each country and store it in blob storage. With this we could create a web page for displaying country data; after a user selects a country, code in the page would grab the country JSON with a single web request and access it as a variable. 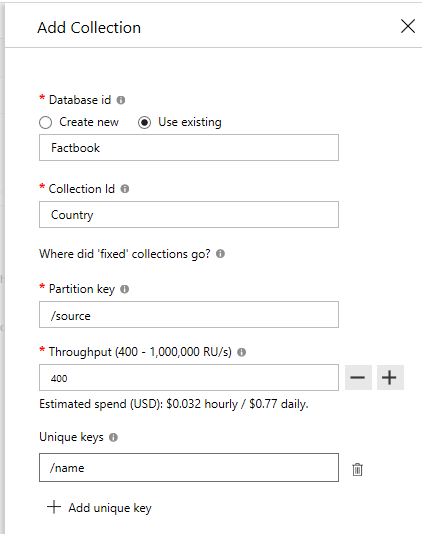 This indeed is one way we'll be storing data, in Azure blob storage. 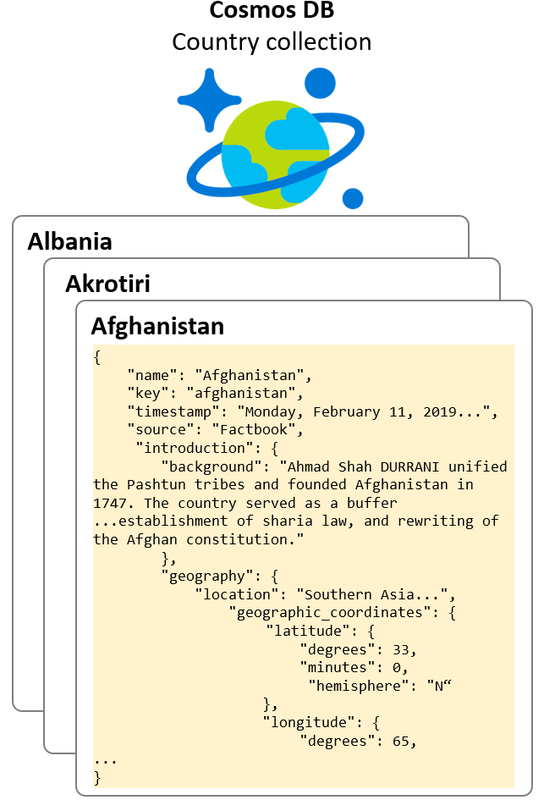 In addition to the JSON data, there is a flag image and map image available on the World Factbook site in the form of .gif files. If we retrieve those, blob storage would be the logical place to store them. We need to have the data in a database for the above activities. A relational database wouldn't make sense here, but a document database is ready-made for this kind of JSON data. So, we'll also be storing our country JSON in a Cosmos DB database. Once this data is in Cosmos DB, we'll be able to mine it richly. Do we really need to store the country JSON data in two places (blob and Cosmos DB)? No, but depending on your needs you might opt for blob storage or Cosmos DB; so we'll do both just to show how. Before we go any further we need to discuss how countries are referenced and organized. The World Factbook JSON data is organized into countries (as well as pseudo-countries and regions). Every country has a country name, such as "Argentina" or "Falkland Islands (Islas Malvinas)". If we take a look at the Factbook JSON, however, we see country records are organized by country key, not country name. A country key is a derivative of the country name, but is lower case, replaces spaces and hyphens with underscores, and drops some special characters like commas and parentheses. The country key for "Argentina" is "argentina". The country key for "Falkland Islands (Islas Malvinas)" is "falkland_islands_islas_malvinas". The country key for "Micronesia, Federated States Of" is "micronesia_federated_states_of". There's one other country identifier we need, a 2-letter code such as "AL" for Albania or "AU" for Austria. The flag and map images we'll be retrieving use 2-letter country codes in their filenames. We'll need the exact list of country codes, country names, and country keys in order to successfully locate the country records and image files. In our code, the Country class holds that data. We'll use Cosmos DB and create a Country collection, with one document per country. 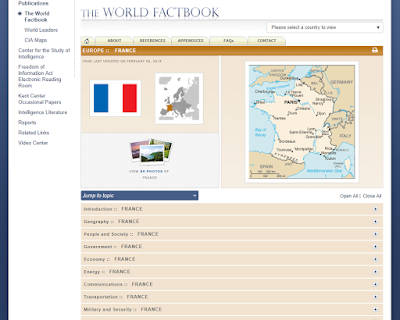 We create a database named Factbook, and within it a collection named Country. We'll be using the property /source for partition key which will have the same value "Factbook" for all records, meaning they'll all occupy the same partition. Although the JSON documents have a lot of detail, there only 260 of them and the total data size is well under the 10GB limit for a partition. The Id for a collection document is /name, its country name. Now that we've determined how we'll be storing data, we need to write the code to retrieve the data and store it. 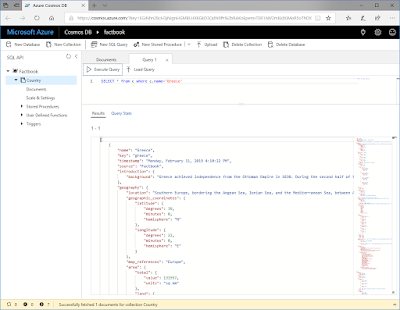 An Azure Function with a Timer Trigger is the ideal vehicle for this: the JSON data is updated once a week, so we'd like our data retrieval/update code to run once a week. A Timer Trigger lets us do just that, schedule how often the function runs. However, a regular Azure Function won't quite fit our needs. It will take some time to download this data and store various parts of it in Cosmos DB and blob storage. A standard Azure Function has a maximum execution time of 10 minutes, and we can't be sure we'll be done in 10 minutes. Fortunately, Azure Durable Functions exist. Durable functions allow us to chain a number of function calls, and they support patterns for parallel processing. They also maintain state, checkpoints, and handle restarts: in other words, they can be counted on to get the job done even if the function gets interrupted. Our durable function will be named Update, and we'll be writing this in Visual Studio in C# / .NET Core. Working locally in Visual Studio has a number of nice benefits, including project/function templates and the ability to run and test locally. We'll be looking at areas of the code section by section below, but if you want to see all of it visit https://github.com/davidpallmann/world-factbook-indexer. At the top of Update.cs, our function code, is some configuration information and global variables. // Storage account - set to your storage account. private static bool LocalTest = false;                  // If true, we are running locally. If false, we're running in the cloud. DownloadUrl is the URL for the JSON file we'll be retrieving once a week from Ian Coleman's github. FlagUrlFormat and MapUrlFormat are String.Format strings for image URLs on the World Factbook site. 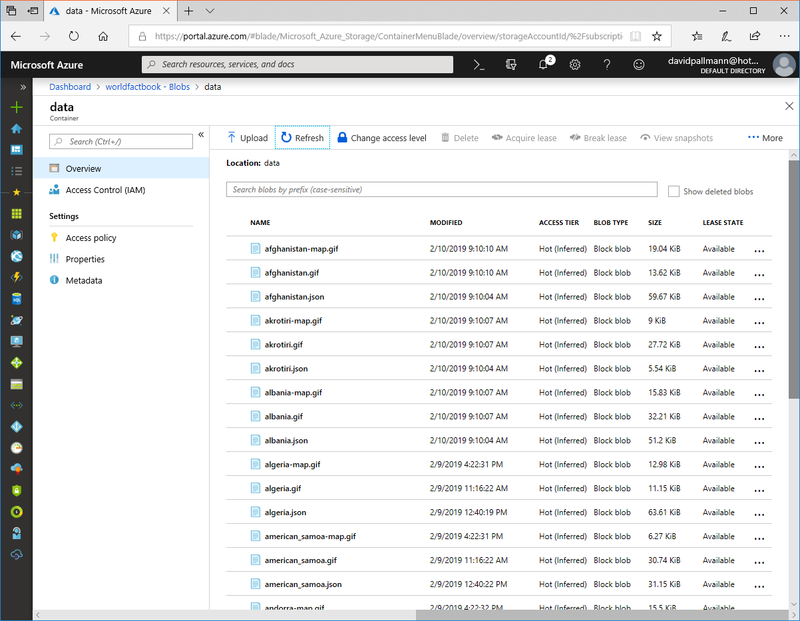 StorageName and StorageKey are credentials for the Azure storage account. ContainerName is the blob container name. EndpointUrl and PrimaryKey are the URL and key needed for accessing our Cosmos DB database. DocumentClient is the document client we'll use to access the database. CountryUrl is the Country collection URL. LocalTest is a flag set to true when testing locally (when true, we can assume local files persist). 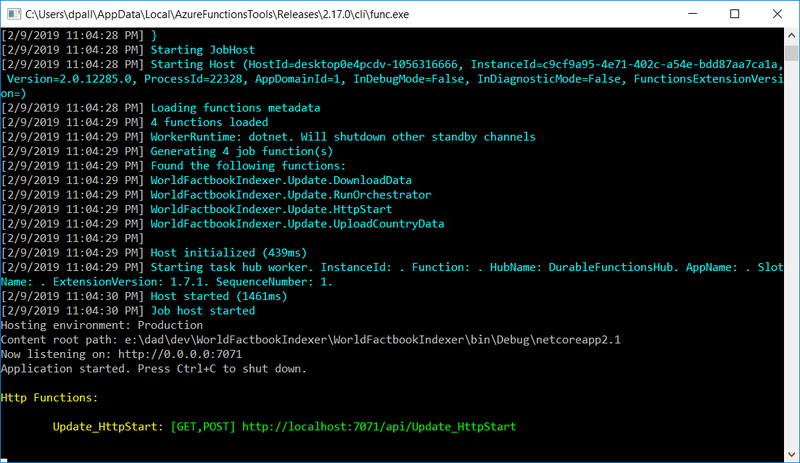 data is a JObject that will hold the bulk JSON after it is downloaded. countries is our country list. A start function connects a trigger event to our durable function. During development and debugging, I configured the start function for Update with an HTTP trigger. This allowed me to run the function locally, and simply hit a URL in a browser to start it running. When running the function out of Visual Studio, a console window appears and displays the trigger URL. Entering this URL in a browser kicks off a run of the function. When development and testing was complete, the trigger was changed to a Timer trigger scheduled to run once a week on Saturday. Once published to our Azure Function (after creating the function in the Azure Portal and downloading a Publish Profile), the function will run on its own once a week. When a trigger fires, the Update durable function starts running. Let's take a look at the code, then we'll explain what it's doing. The Update function invokes a number of sub-functions. It first calls a DownloadData function (line 12), whose purpose is to download the large bulk JSON data for all countries. The call to DownloadData uses the await keyword to wait until the function completes. If it completes successfully, it will have left the JSON in a global variable named data. Note the way the function is invoked, with context.CallActivityAsync. In a durable function, other functions must be called this way in order to preserve state and create recovery checkpoints. Now it is time to extract the data for each of the 260 countries and update blob storage and the Cosmos DB database. If we did this linearly, we'd run out of time. Azure Durable Functions give us a pattern for working in paralell, called the fan-out/fan-in pattern. Lines 20-22 show a loop through each country in our country list. The function UploadCountryData is launched, this time without the await keyword, for each country. Then, line 23 waits for all the tasks to complete. The Country class represents a country, and contains three properties: Code, Name, and Key. Key is computed from Name automatically. Country also has a static method List, which returns the full country list. // Return key that matches JSON key in list of country objects. // List - return country list. 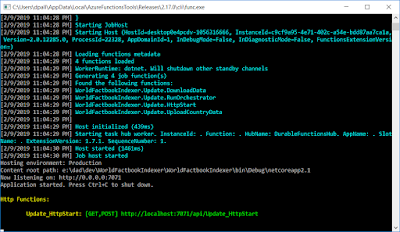 The DownloadFunction must retrieve the bulk Factbook JSON and load it into the global variable data where other functions will expect it to be. The data is downloaded using a WebClient. Once retrieved it is parsed into a JObject. JObject will allow other functions to access the hierarchy of the the JSON. The UploadCountryData function is passed a Country object from the master country list. Using the country object's Key property, the country JSON record can be found in the data object. This fragment of the overall JSON, our country record, goes into a JToken object. We inject three of our properties into the JSON: a source column, which Cosmos DB is expecting in order to set the partition key; a timestamp column, so we can track when this record was captured; and a key property, the country key. 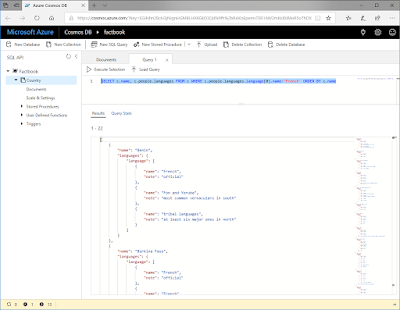 // Add properties to the Country JSON. //   source: The Cosmos DB County collection uses /source as the partition key. //   timestamp: timestamp when this data was collected. 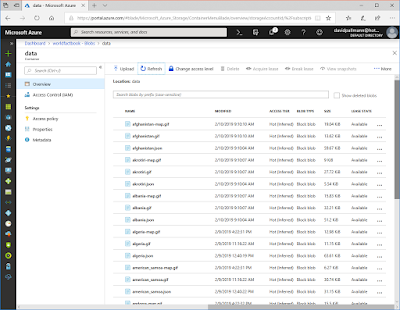 The UploadCountryData_UploadJson function is responsible for uploading the country JSON to Azure blob storage. For this I am using the PolyCloud.Storage library. Here's a link to an uploaded JSON record in blob storage. Prior to adding the country database record, any existing database record for the country is removed. To locate existing records for the country, CreateDocumentQuery (line 11) is called to query for the country name. If any records are found by the query they are deleted with DeleteDocumentAsync (line 32). Because this function is one of many running in parallel, we must account for too many database requests that exceed the throughput rate for the collection. That is why the code has a queryDone flag, is surrounded by a loop, and has sleep logic in its catch handlers. In the event of a Request Rate Too Large Error, the thread will sleep using the RetryAfter property of the DocumentClientException, a computed value optimized for just this pattern of retries. The delete will be attempted up to 3 times in the event of this error. With any prior country record removed for this country, we are free to add a record with the current data. Like UploadCountryData_DeleteRecord, this follows the same sleep-and-retry-on-error pattern if the request rate is too large. The database record is added with CreateDocumentAsync (line 13), passing the JToken object with the JSON country data. The UploadCountryData_UploadFlagImage function has the job of downloading the country flag image from the World Factbook site and uploading it to blob storage. This is skipped if a flag image for the country is already present in blob storage. A constant string in the code has the format of the URL for the flag image, including a placeholder replaced by the 2-letter country code. The image is downloaded with WebClient, and is then uploaded to blob storage using the PolyCloud.Storage library. // Download country flag image and upload to blob storage as <country>.gif. Only do this if blob does not already exist. Here's a link to a country flag image in blob storage. The UploadCountryData_UploadMapImage function is just like UploadCountryData_UploadFlagImage, except it is retrieving and uploading a map image. All the mechanics are otherwise the same. // Download country map image and upload to blob storage as <country>.gif. Only do this if blob does not already exist. Here's a link to a country map image in blob storage. We have countries from Afghanistan to Zimbabwe in the results, a good sign. Now to look at the entire record for a country to make sure the complete JSON country record is intact. The Country records look like we expect them to, with lots of detail. We also see the three properties we injected into the JSON: key, timestamp, and source. The results match our expectations: the results span from Anguilla, Aruba, Barbados... all the way to ...Venezuela, Virgin Islands. 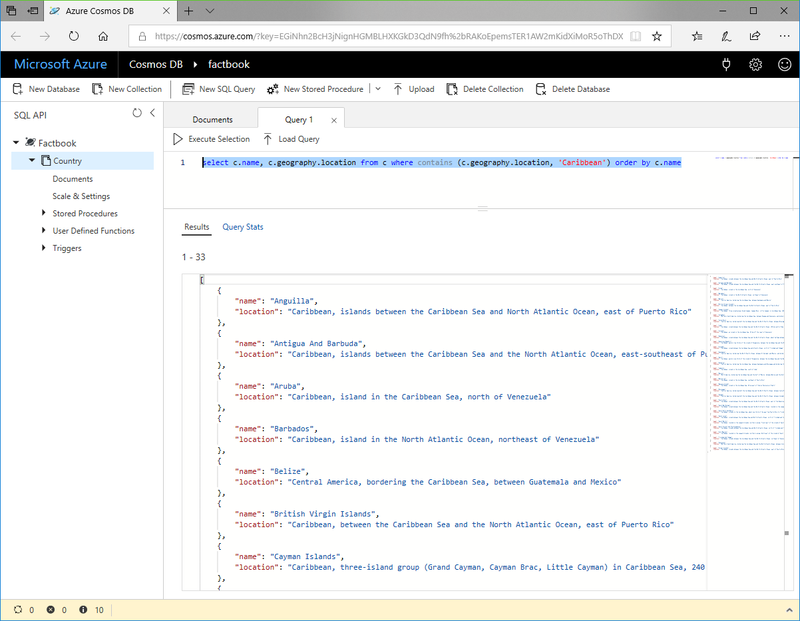 We've built the code to pull down public-domain CIA World Factbook data and create our own country repository on Azure; including a detailed country record, flag image, and map image for 260 countries. To hold the data we create both a blob storage container and a Cosmos DB country collection. 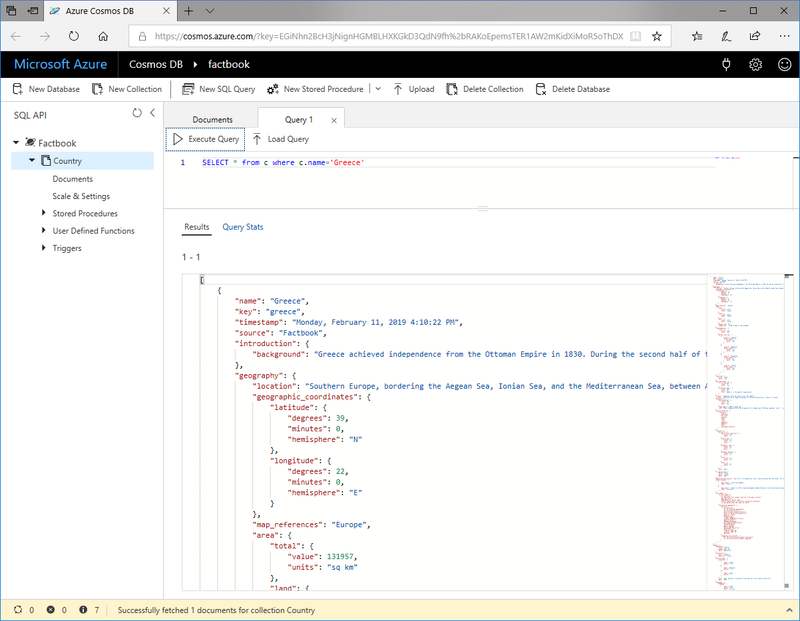 We used Azure Durable Functions to retrieve and store the latest data, and used a Timer Trigger to schedule updates each Saturday. In our code, we used the fan-out/fan-in pattern to extract country data in parallel. In Part 2, we will create the front end, including an API and a web site. We'll also be using Azure Functions for that.